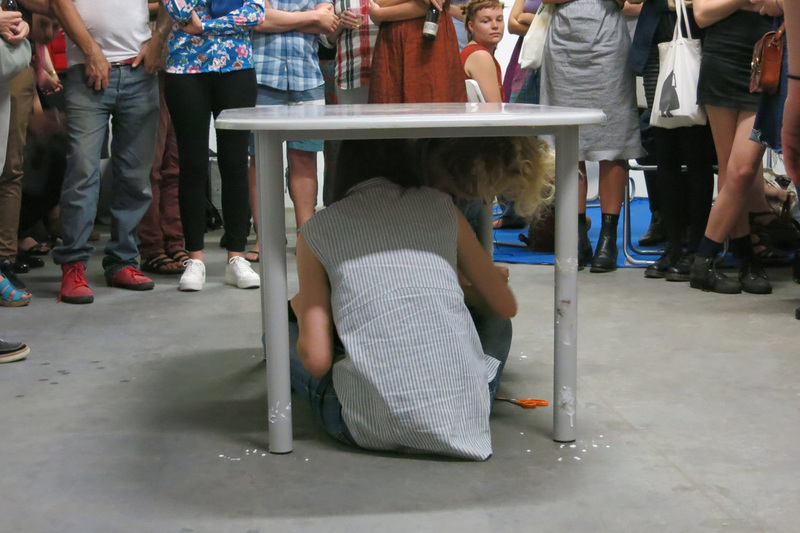 Hairy Legs was a performative work by Erika Scott and myself that involved cutting each others hair under a table, and gluing each others hair to the legs of the table. Hairy Legs took place as part of an exhibition at Boxcopy curated by Rachael Haynes, Conversation Pieces which opened on International Women’s Day 2014. The exhibition presented works by Australian artists Agatha Gothe-Snape, Alex Martinis Roe and Hannah Raisin and collaborative works by Catherine or Kate, Scott Ferguson (Erika Scott & myself), Courtney Coombs & Caitlin Franzmann. It involved artists engaging with ideas of contemporary feminism through processes of dialogue and exchange; exploring subjectivity, humour and intimacy in performance and installation works. The works were generated by physical, verbal or textual dialogues between collaborators, participants or the artist and audience; and sparked a conversation about feminist art practice today.